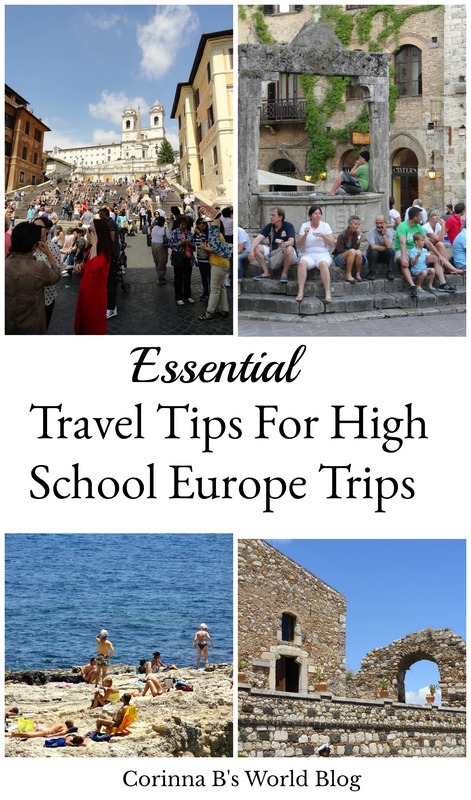 Is your child taking a trip to Europe through their high school? Do you have questions about how to work their money, cell phones, passports and electronics? What about their personal safety? One of my friends called me recently with lots of questions about all these things. Her son is heading out on a high school Europe tour with EF Tours, and she was worried about how to handle money and phones in Europe. My son is going with EF Tours later this year, and I am sure there will be plenty of other parents wondering how this all works, so today’s blog post is all about some expert travel tips for High School Europe trips. Europe is really easy to navigate, and generally is very safe. Having a few tips and tricks up both your sleeve and your child’s sleeve can make this experience even more wonderful for them and less stressful for you! I am also a mom, and I am in Europe multiple times per year, so the information below is all based on my personal experience. I have broken this up into main categories to make it easier to navigate. Take cash in small denominations. Your child should arrive with some cash, ideally $50 – $100 converted to local currency. Order cash in small denominations (E20 and smaller) from your bank. Once your child arrives in Europe they can use their debit card at bank ATMs, where they will get the best exchange rates. Take 2 cards. Your child should take 2 separate debit and/or credit cards with them. If they lose one card they will then have a backup card. Split up your cash and cards. The 2 credit/debit cards and the cash should be separated, so that each card with half the cash is put in two separate places. One half could be kept in their money belt and the other in a secured place in their day pack. This way if they get pick pocketed or if they misplace their wallet your child won’t be left stranded with no money and no access to money. Even if your bank has branches in a city your child will be in, chances are they will not be able to get a new card to your them on time. Call the number on the back of each card and register it to go overseas. The bank/financial institution will ask for the dates of travel and for the countries the card will be going to. They will assume the card has been stolen and shut it down the first time it is used if you don’t register it first. If they shut the card down they won’t just re-open it, they will need to issue a new card, leaving your child without access to money for the remainder of their trip. Photograph their credit/debit cards back and front and their passport picture page. Email the photos to yourself and to your child. If they do lose their belongings and/or their phone, or if they don’t have access to their phone, they can at least log in to their email and retrieve their passport and card details. Email a list of telephone numbers to your child. Most of us have telephone numbers in our contacts on our phones, and no longer have them memorized. Should an incident occur and your child not have access to their telephone, they need to be able to reach you and other family members, as well as their tour leader. One of the easiest ways for your child to keep their money and cards secure is to wear a money belt. This is a flat pouch that they either wear under their clothes around their waist or around their neck. Make sure you choose one that won’t sweat and rub against their skin. 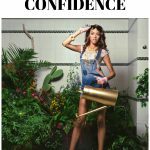 My recommended money belt is linked below. If your child is responsible for their own passport they will keep it in the money belt. Your child will take out the money and card that they need for the day, and everything else stays zipped inside their money belt. 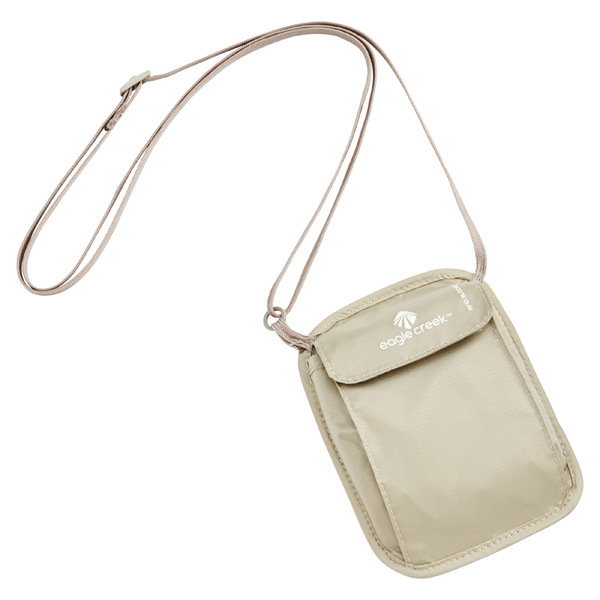 Your child must understand that their money belt is not a second wallet, it is a portable safe. They must not touch it or get anything in or out of it while they are anywhere public. Pick pockets/thieves can see them access their money belt and are adept at quickly separating them from it. 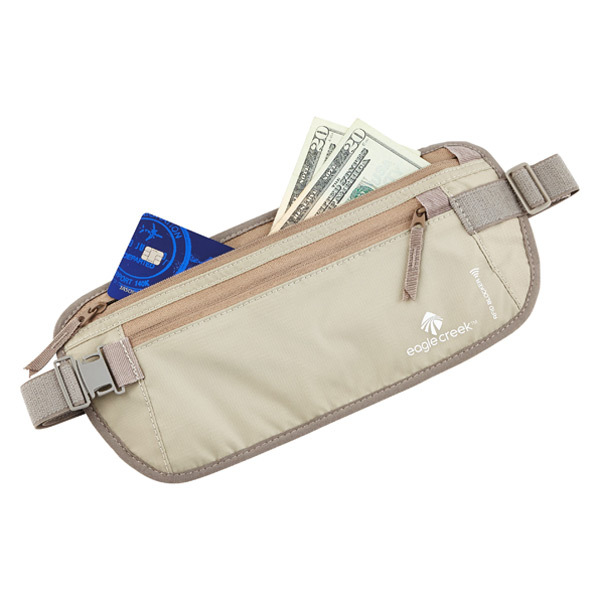 I recommend this Eagle Creek Money Belt with RFID blockers or this RFID Blocking Undercover Neck Wallet available online here at The Container Store. The best and least expensive way to access money while away is to use ATM machines. Here are some important guidelines for using ATM machines in Europe. ATM Fees. Every time you withdraw money you will incur and exchange rate fee, an ATM fee locally and a foreign ATM fee from your home bank. Your child should pull out money less frequently and withdraw more money at a time. Withdrawing $20 per day could be costing you $30 per day. It is smarter to withdraw $100 at a time. Airport ATM machines have the very worst exchange rate and should only be used in an emergency. Only use ATM machines that are part of a bank. Ideally only use the ATM machine inside the bank, during hours the bank is open. There is less chance of an ATM being cloned when it is inside the bank, it is safer to be inside the bank when withdrawing cash, and should the ATM machine eat your child’s card the bank can organize having the machine opened to retrieve it. You can buy sleeves for your credit cards and passport sleeves that contain RFID blockers that prevent hackers from accessing the digitized information on the cards and passport. The magnetic strip on the card not only contains information pertaining to the card, the passcode and the bank account, but also home address, social security number and other details. 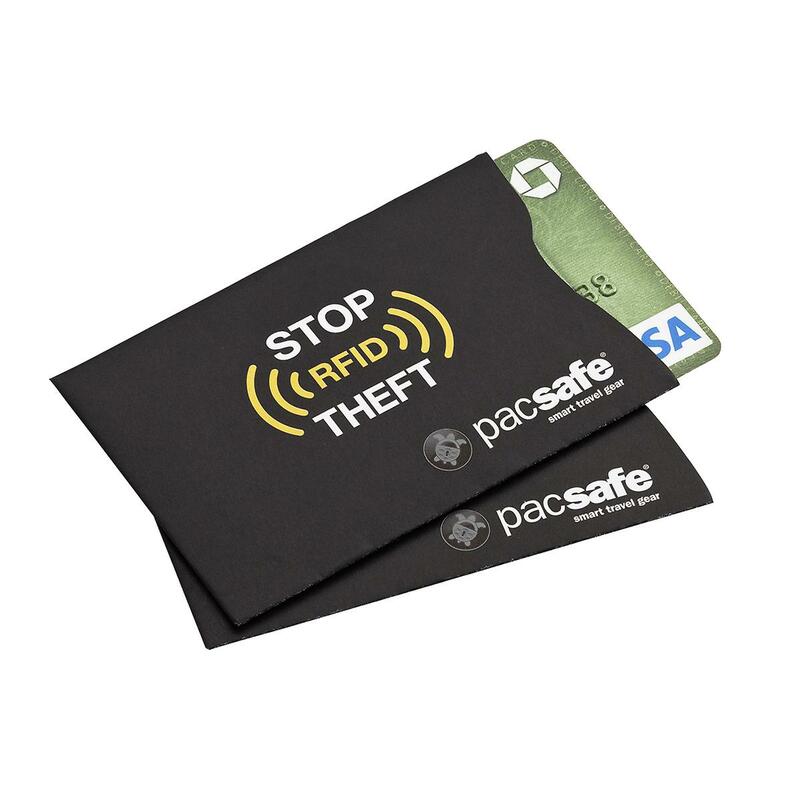 An RFID blocking wallet or RFID blocking sleeves for credit cards and passports add a layer of safety as well as peace of mind! I buy my RFID travel products online at The Container Store. Electricity in Europe runs at 220 volts instead of the 110 volts used here in America. Europe also has different plugs and power points than other places in the world, so your child needs to have an adaptor with surge protection and with a variety of plug configurations. 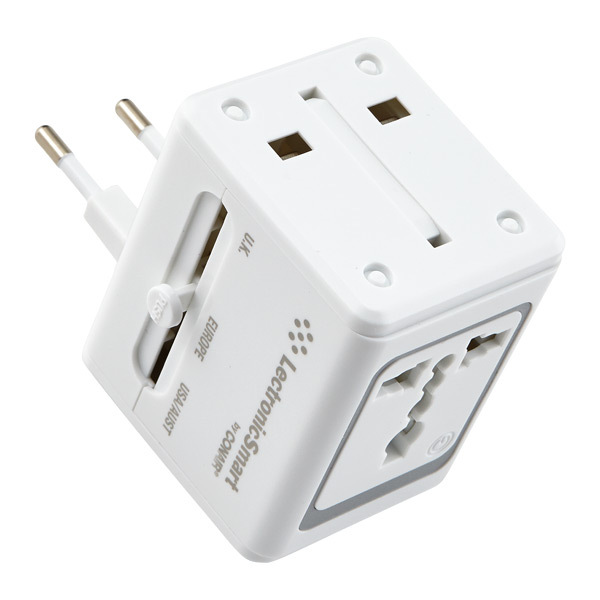 I use the Travel Smart All In One Adaptor from the Container Store. 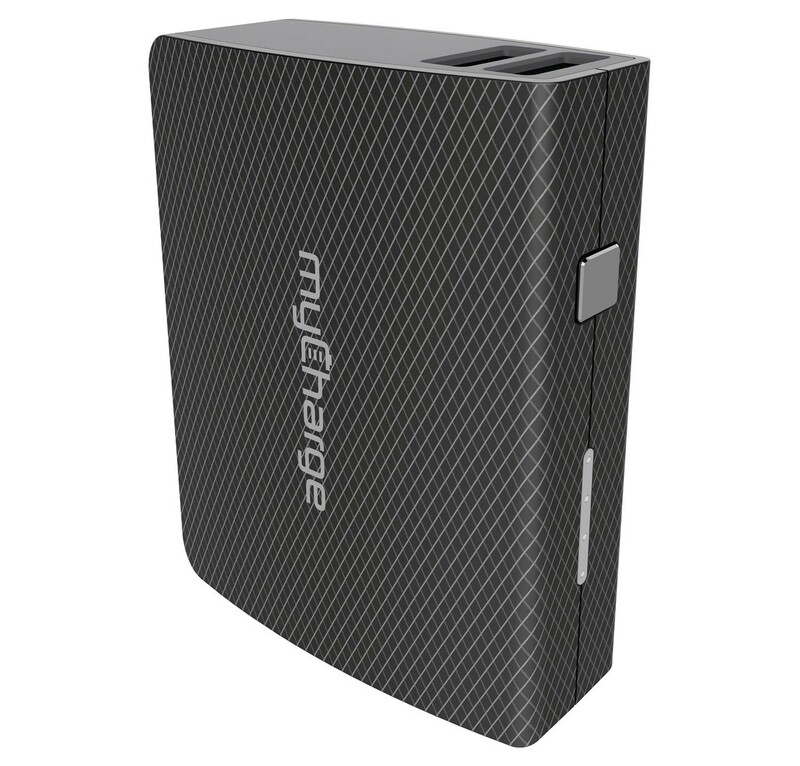 This one has configurations for 152 countries, has USB ports, converts the energy so that it doesn’t blow your gadgets, and also has surge protection. My son’s school trip will be going both to London, then on to Europe. British electronics have a different plug on them, so he requires an adaptor that does both the U.K. and Europe. This has attachments for both. Check with your child’s cell phone carrier what international plans they have. Without an international plan you could end up with an enormous phone bill! (One of my friends got a $734 phone bill after spending 10 days in Europe). Some carriers have unlimited free service in Europe, others require a fee. Verizon (my service provider) charges $10 per day and gives you access to your data plan at home. You can access free WIFI in most of Europe, whether on a city’s free WIFI or in cafes and restaurants. It is often incredibly slow, and always puts your child at risk of being hacked. Make sure they understand to only use free WIFI to upload photos and to google information. They mustn’t use free WIFI to access banking information or anything that requires security. Your child should be aware that using social media with free WIFI gives hackers access to all of their information. It is just not worth it. Have your child download the What’s App app to their smartphone, and have everyone at home do the same. So long as you are in WIFI you can text, chat and send videos and photos to one another via What’s App for free. This is especially helpful if your service provider is giving you only limited talk and text internationally, or limited free talk and text. It is also a much less expensive way (It’s free!) to send photos and videos and also to video chat. Your child must know to charge the battery every night, and to leave each day with their phone and the battery both fully charged. It would be such a shame to miss out on taking photos because their phone died. They will need a phone charging cord to use with their external battery. Find out from your cell phone service provider how much data is used uploading to social media. Sometimes even uploading just a few things a day can wipe out a data plan very quickly. Make sure to pack a change of clothes in your child’s day pack/carryon bag. If your child’s suitcase doesn’t arrive with their plane they need to be able to change their clothes. I recommend packing one pair of pants/skirt, two or three tops and underwear for three days. When suitcases go missing they are normally reunited with the traveler in 3 days. Worst case scenario your child can wash clothes at night or buy some new clothes to tide them over if their suitcase doesn’t arrive within the three day margin. Most of the time suitcases do arrive with the correct flight, but it is better to be safe than sorry. Pack a phone charger in your child’s day pack. Your child needs to board their international flight with a fully charged phone. They should have a charging plug and cord in their day pack/carryon bag. Also have an international wall plug so they can charge their phone when they land. Some airplanes have phone chargers in each seat, but they don’t always work. Other planes don’t have them at all. Your child should also have a fully charged external phone battery in their day pack. They need to understand this must be fully charged every day. In the event of your child being separated from the group, or heaven forbid, some crisis occurs, your child MUST have a fully charged external battery for their phone. While in Europe your child will be taking lots of photos on their phone as well as uploading to social media. Both of these things deplete phone batteries quickly, so it is essential that they charge their external battery every night so that they can re-charge their phone should it run out while they are out sightseeing. Pack less not more. Choose outfits that can mix and match easily, and pack fewer things rather than more. Not all hotels have elevators, and if your child has to drag a heavy suitcase from the bus to their hotel room every day it can be stressful and exhausting. Don’t rely on hotel soap and shampoo. Pack products that work well for your child at home – you don’t want to run the risk of your child having an allergic reaction to a foreign product while on their trip. Use Packing Cubes. The easiest way to pack and stay organized while traveling is to use packing cubes. 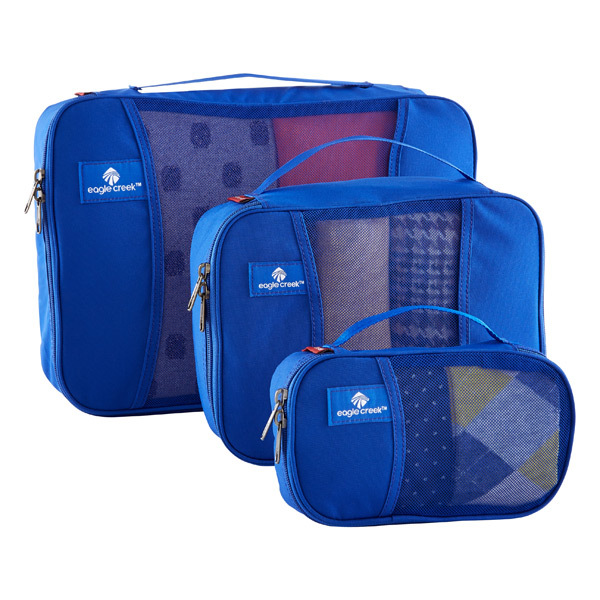 I have been traveling with Eagle Creek Packing Cubes for years. I buy mine at The Container Store. The Eagle Creek packing cubes are sized well and are sturdy. I have tried others but have found them to be a waste of money. Make sure your child’s passport has at least 6 months before it expires. Many countries will block your child’s entry if the passport is expiring in 3-6 months. * Your child should keep their passport in their money belt and only remove it when boarding flights or crossing borders (if necessary). There must be one set place their passport is kept, unless the teacher is holding all passports. Some other really useful items to pack. Ziplock bags. 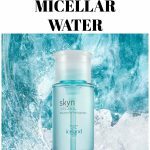 These come in super handy if clothes aren’t dry and have to be packed, for soaps and shampoos etc that may be wet or leaking, or for any incidental items. Bandaids. Europe requires lots of walking so you don’t want a day ruined by blisters. They do sell bandaids in Europe, but your child won’t always be able to run to a pharmacy to buy them. Tums/Rolaids travel sized packs of antacids can be a savior if the different cuisine upsets your child’s stomach. Halls or Cough Drops. The dry air on long flights can have you coughing. Pack some Halls or cough drops into your child’s day pack/carryon bag so that if they do start coughing during the flight they can get some relief. Wet Wipes and Tissues. Depending on where your child’s tour is going they may (or may not) encounter public toilets with no toilet paper or no soap/hand washing availability. A travel sized pack of baby wipes and a travel sized pack of Kleenex can save the day should that occur! Fabric Softener Sheets. Even the tidiest, cleanest person can wind up having a stinky suitcase. I always put a couple of Bounce sheets in the bottom of my suitcase to keep everything smelling good! Thick Socks. It doesn’t hurt to have an extra pair of thick socks on hand in case it gets cold at night. Chances are there won’t be the same comforters/duvets on the beds as you have at home. If your child does get cold at night a pair of thick socks can make all the difference in the world. Shower Shoes. If your child’s trip will be using dorm room type showers, or the accommodation will have shared showers, some type of shower shoes or flip flops can help prevent a fungal infection. Don’t Bring New Shoes. Europe involves lots and lots of walking and there are plenty of cobblestoned streets. Your child should have well broken in shoes to avoid new-shoe blisters. Their footwear should be comfortable and support the foot. Don’t Bring High Heels. With all the cobblestoned streets in Europe high heels almost guarantee either broken heels or twisted ankles. On top of that there is so much walking on European trips that high heels are just not a smart idea. Pack An Extra Pair Of Shoes. In case of rain or shoes getting wet and not being dry the next morning it is a good idea to have an extra pair of shoes packed. Pack Socks. Even if your child doesn’t wear socks at home, they can help prevent blisters and stop feet from sweating excessively with all the extra walking. Pack Clothes That Layer. The best bet for clothing is to pack items that layer well so your child can add on or take off layers as the weather requires. I buy most of my travel products online from The Container Store. This post is not sponsored by The Container Store Over the course of years of international travel I have found their products to be well made and to be of excellent quality. I have had enough annoying experiences in the past with travel products from other companies breaking or not functioning while I am away, to make me be a loyal customer to The Container Store where everything always seems to work. They have many more travel products than I have referenced here. You can see The Container Store’s entire travel section here. If you found this post helpful please share it with other parents who have children taking school trips to Europe! There are social media icons at the bottom of this post. If you have questions about travel tips for your child’s trip, or if there is something I didn’t cover, please leave me a comment below. If you ask me in the comment section then other parents can benefit from reading your questions too! Your child is going to have a wonderful trip and will create memories that last a lifetime.